Art therapy is beneficial for seniors. Why should you provide clients with art therapy? 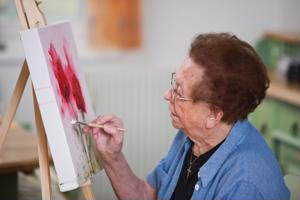 Having a creative outlet is always beneficial, especially for clients of senior care services. Since many of these individuals may be retired, providing them with different ways to use their brain is important, and being creative gives them a chance to have some fun. Art therapy has been proven effective by many studies as an outlet for older adults because it helps seniors relax, enjoy themselves while they create something and cope with illnesses like dementia and Alzheimer's disease.